Australian heat specialist, Thermofilm, has developed the unique Crossray BBQ, the ultimate gas BBQ with patented technology that delivers high intensity infrared heat, which cooks food that is tastier and juicer. The Crossray BBQ eliminates the need for any other outdoor cooking appliance: pizzas that taste like wood-fired pizza can be cooked in minutes including pre-heating; paella that can be cooked in 20 minutes; and slow-cooked lamb shanks in gravy on an upper level cooking area functions like a traditional oven. It's so easy to use that perfect cooking results can be achieved even by novice barbecuers with the choice to BBQ, grill, smoke, use as a pizza and outdoor oven and do 'low and slow' cooking, either with the lid up or down. Temperatures from 110 degrees for slow cooking to 380 degrees Celsius for a pizza is easily and quickly provided and controlled. Kids can have fun with their dads making pizza for family and friends. It delivers the intensity and quality of charcoal with the convenience and control of gas. A key secret of the Crossray BBQ is the ultra-efficient infrared burner technology that provides significantly more heat and cooks food quicker, which keeps food moist and cooked to perfection. The BBQ also uses 50 per cent less gas than traditional barbecues. Crossray Ambassador and former Melbourne AFL footballer, David Schwartz, is a BBQ lover and said Crossray's infrared technology cooks food evenly with no hot and cold spots and because food is cooked so fast it doesn't get dried out. "The uniquely positioned ceramic infrared burners are mounted at the sides of the Crossray, angled up at the cooking surface and have a thin cover strip over the burner, which means fat drains away resulting in less smoke and virtually eliminates dangerous flare-ups that can char food," Schwartz said. "This design and the fact it uses significantly less gas, so fewer changes of gas bottles, will appeal to anyone who enjoys outdoor living, entertaining and cooking for family and friends. "As men are mostly in control when outdoor cooking, they will appreciate the ease of cleaning. After use, you simply run on high for five to 10 minutes when most of the residue is burnt off. It's the closest thing to a self-cleaning BBQ you can get." 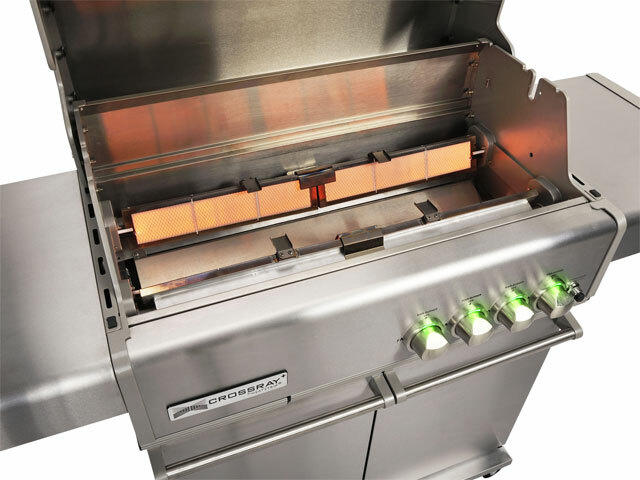 The Crossray BBQ has numerous high-end features including high-grade stainless-steel construction, LED illuminated knobs, a large upper level cooking area and electronic ignition. The new Crossray by Heatstrip system was developed over a decade by Australian award-winning designer and manufacturer of energy efficient products, Thermofilm, which launched its first Heatstrip outdoor infrared heater in 2010. Covered by worldwide patents, the Crossray technology is derived from trying to replicate the perfect natural cooking medium; a bed of red hot coals. * The lower level allows the infrared heat to penetrate the food keeping it moist unlike an open flame BBQ that just heats the air around the food and dries it out. This area is perfect for portion-sized meats, pizza, vegetables and fritters. * An additional large upper level area operates like a traditional oven offering low and slow cooking, which is suitable for roasts and other large meats, fish, casseroles, vegetables and deserts. "The Crossray is a clever and smarter way to cook and you can really taste the difference," said Schwartz. "It's ideal for people who aren't getting perfect results every time with their existing BBQ and want the latest and best-designed cooking system on the market. "It provides expert professional results for an ultimate cooking experience yet is so easy to use." The Crossray range includes a 4-burner and 2-burner model with each burner having a heat capacity of 13 Megajoules per hour (MJ/hr). A trolley model includes stainless steel side shelves on either side of the unit and die cast aluminium end caps. The RRP of the Crossray 4-burner built-in unit is $1499 while the 4-burner trolley unit is $1999. The 2-burner built-in unit is $1199 and the 2-burner trolley unit is $1699. They are available from Harvey Norman and independent specialist barbecue retailers. The Crossray by Heatstrip 4-burner trolley unit with doors measures 1685mm (w) x 505mm (D) x 1255mm (H); 1495mm (H) with lid open and the 4-burner in-built unit measures 910mm (w) x 505mm (D) x 560mm (H); 800mm (H) with open lid. The 2-burner trolley unit measures 1405mm (w) x 505mm (D) x 1255mm (H); 1495mm (H) with lid open and the 2-burner in-built unit measures 635mm (w) x 505mm (D) x 560mm (H); 800mm (H) with lid open. Standard inclusions are three cast iron grill plates for 4-burner models and two for 2-burner models, a gas hose and regulator, quality castor wheels and a temperature gauge on the hood to help maintain optimum cooking conditions. A cast iron hot plate, an outdoor vinyl cover and natural gas conversion kit are optional accessories.